weeblrAMP can work together with some of the most common WordPress plugins, in order to achieve better SEO or interactivity. In case something goes wrong, or you use another solution, you can disable each of them from being used on AMP Pages. 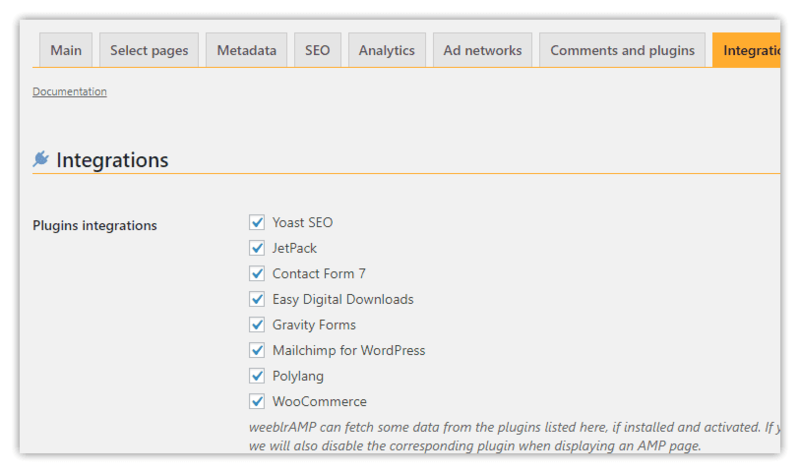 Yoast SEO and JetPack integrations are available in weeblrAMP Community edition. Other integrations require the regular edition of weeblrAMP. WooCommerce support is very extensive. The integration mentioned here fetches product data, while the specific (and separate) WooCommerce theme plugin handles all the display and customization. Please get more details on the dedicated WooCommerce section. For more details, please see the Easy Digital Downloads dedicated page. The Mailchimp for WP integration lets MC4WP sign-up forms works in the same way on your AMP pages. Conversion of your forms are automatic. Please see the MC4WP dedicated page. provide support for Jetpack Project and Testimonials custom post types.